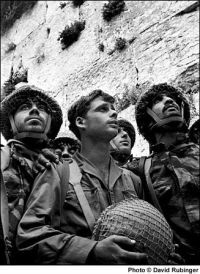 Israel Is Forever: Special feature to the Calling Out Community, Posted May 20, 2015. Updated November 12, 2015. 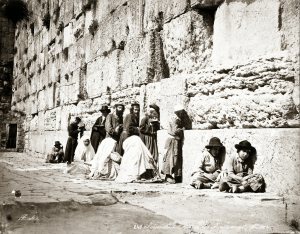 The Western Wall of the Temple Mount (Hebrew: הכותל המערבי‎, translit. : HaKotel HaMa’aravi), sometimes known as the Wailing Wall or the Kotel, is an important Jewish religious site located in the Old City of Jerusalem, the eternal capital city of Israel.The Wall aboveground consists of 24 rows of stones (or “courses”) of different ages, reaching a total height of 18 meters (6 meters above the level of the Temple Mount). Another 19 rows were discovered beneath ground level in 1867, dating back to the Second Temple period, and built around A.D. 19 by Herod the Great. Today, nearly all of the visible layers were added from the 7th century onwards. In the Scroll of Ahimaaz, the story of a Jewish Italian family written around 1017 AD, Jews were encouraged to pray at the former Temple site “is as if he has prayed before the throne of glory because the gate of heaven is situated there and it is open to hear prayer”.Jewish Law also dictates Jews should pray the Amidah (Silent Prayer) facing east towards Jerusalem, the Temple and ultimately the Holy of Holies, as they believe the glory of God never departed. 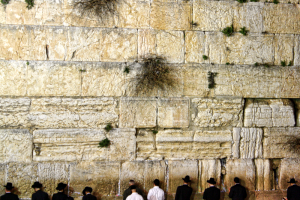 According to the Talmud, the Western Wall was the closest of the 4 original walls to the Holy of Holies – so praying by this Wall was very “beneficial”. This was made almost impossible for the Jews by the May 15, 1948, invasion of Jerusalem by the Jordanian army which occupied East Jerusalem including the Temple Mount, cutting Jews off from the holy siste for the next 19 years, with only about 28 meters being accessible for prayer.On June 7, 1967, during the Six Day War, Israel Defense Forces (IDF) paratroopers pushed through the Old City to the Temple Mount, reuniting Jerusalem, and bringing the holy sites back under Jewish control for the first time in 2000 years.Since then, the Festival of Sukkot (“Tabernacles”) was reinstated, encouraging Jews to make a pilgrimage to Jerusalem and the Holy Temple three times a year, on Pesach (Passover), Shavuot (Pentecost) and Sukkot (Tabernacles). October 6, 2006 – the largest Skkot festival in the history of modern Israel to date. 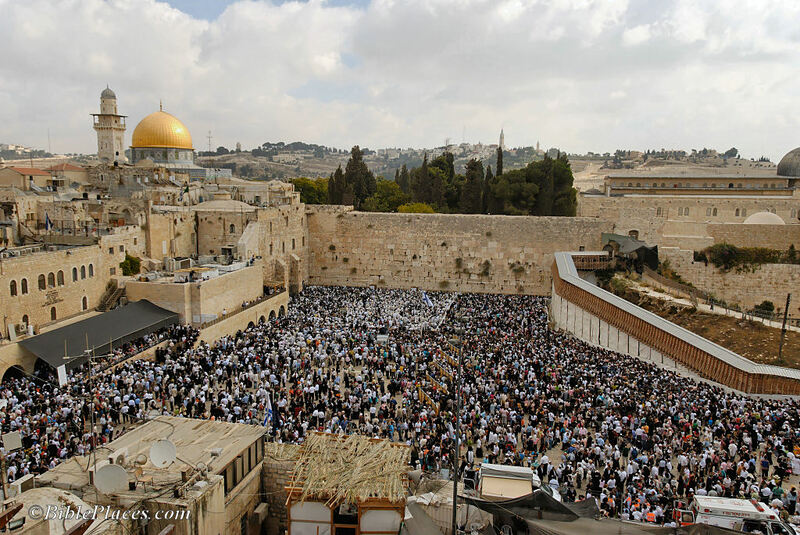 During the annual Sukkot in October, hundreds of kohanim (Jews who trace their lineage to Aaron, the first High Priest) stand closest to the Western Wall, to receive special blessings by the Chief Rabbi of Jerusalem, recognizing the commandment of God to Moses (in Numbers 6:23) to bless “the sons of Aaron”. The crowds grow annually for this Sukkot, with the October 6, 2006 event being the largest ever gathered for the Festival in modern history. Today, many carry on the tradition of writing small prayers to God, and pushing the papers into the cracks of the Wailing Wall, believing that God pays special heed to these prayers. Tagged with:Aaron, Ahimaaz, Amidah, ben Paltiel, East Jerusalem, face east, Feast of Tabernacles, Herod, herod the great, Holy of Holies, IDF, Israel, Israeli Defense Forces, Jerusalem, Jordan, Jordanian, King, kohanim, Kotel, Numbers 6:23, Passover, Pentecost, Pesach, pray, prayer, Scroll, Shavuot, Silent Prayer, Six Day War, Sukkot, Talmud, Temple, Temple Mount, Wailing Wall, Western Wall. Previous PostThe Pope and Palestine: Abbas Is An “Angel”? Next Post“O Canada”, We Stand On Guard For Thee!